Yarn and Darn was started by a small club of local wives, mothers and sisters of people deeply affected or traumatised by the conflict. 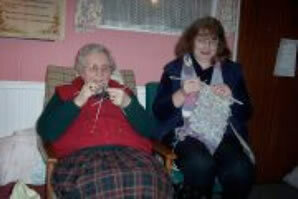 They used to meet each Wednesday in the back room of the original Charity Shop, to talk and make craft items. 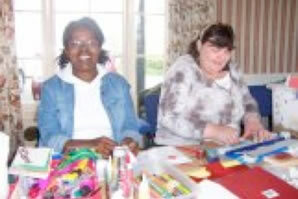 Their mission statement Talk back, look forward reflects their ethos of discussing life’s events and effects upon their hurt and pain to develop relationships of trust as they produce craft items. These women come from all walks of life and are representative of both sides of the political divide. 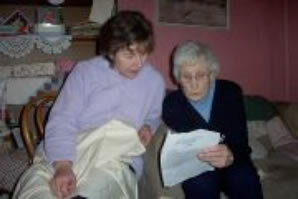 They were awarded a Millennium Grant in January 2004, with which they invested in a sewing machine, a laminator, paint sprayer and craft items. They would make craft items for sale in the Charity Shop. This proved successful and orders were taken which help to replace materials and raise the profile for the group and their craft product. The unseen product is the level of trust, hope and reconciliation experienced by all involved. They have also discussed business opportunities and ways to help victims of the troubles who do not attend any victims support groups. Yarn and Darn currently meet on a regular basis and are excited by the new opportunities that the new Coach House building brings.